A screenshot from the entanglement simulator. More than 80 percent of North Atlantic right whales become entangled in fishing lines at least once in their lives, making it a leading cause of death for the critically endangered whale species. Now, with the help of new entanglement simulation technology, scientists at the New England Aquarium are working to change that. Tim Werner, a senior scientist at the aquarium’s Anderson Cabot Center for Ocean Life, is one of several aquarium researchers who collaborated with scientists from Duke University to develop a graphic model that gives them an opportunity to study entanglements and potential solutions in a practical and humane setting, aquarium officials said in a press release. “This gives us a tool we can use right away to say, ‘If you have an idea, let’s evaluate it,’ and we can evaluate it over the course of several days rather than over the course of several years,” Werner said in a telephone interview. The goal for developing the model was to reverse-engineer entanglements in order to figure out ways to modify fishing gear so that it poses less of a risk to helpless marine animals going forward. “If you can re-create the way the rope wraps around the animal in the model, you can figure out how to change the gear to reduce the risk of entanglement,” Werner said, according to the release. The researchers’ findings were published Monday in the journal Marine Mammal Science. Aquarium researchers worked with Duke professors Laurens Howle and Doug Nowacek. 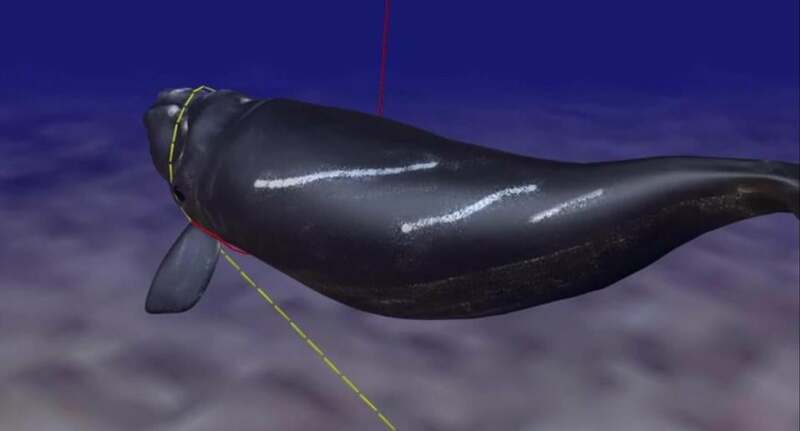 The graphic model the scientists designed is an interactive simulator that allows them to control a virtual right whale on a screen using a video game controller, letting them move the whale through a field of virtual fishing lines. When the whale makes contact with a fishing line, it makes the kinds of swimming motions that a real whale would in that scenario, like rolling away from the rope, giving researchers accurate and valuable information about how whales and fishing gear interact, officials said. The fishing lines in the simulator respond to the virtual whale’s contact the way they would in real life. The scientists are able to adjust the line configuration, strength, and flotation ability to correspond with different types of rope that whales come across in the ocean, officials said. If a whale bites down on a fishing line, the rope can become tangled in its mouth, hindering its ability to feed. Trailing fishing gear, which tends to affect whales whose fins become entangled, creates drag in the water that forces whales to exert additional energy just to move, presenting a constant and serious burden that, over time, can lead to death, officials said. The North Atlantic right whale is one of three whale species living in New England waters that is in the midst of an unusual mortality event. Scientists believe the cause of all three to be human interaction, with North Atlantic right whales and Atlantic minke whales being especially affected by fishing line entanglements, according to NOAA Fisheries . There may be as few as 411 right whales left in the North Atlantic, and that number is expected to drop, as there were no new reported births in the last breeding season. Only about 71 of the remaining whales are females of breeding age, officials said. “If you combine several things, including the increase in incidents and the severity of entanglements, with no new individuals added to the population this year, that’s a formula for extinction,” Werner said. If nothing is done to reduce the number of entanglements soon, North Atlantic right whales could be extinct in a few decades, he said. But right whales are not alone in their struggle with fishing lines. Other marine animals, including sea turtles, become trapped in fishing gear on a regular basis. Werner said he hopes to apply the graphic model’s technology to other ocean animals in the future, specifically leatherback sea turtles, of which aquarium veterinarians have treated two in the last three weeks. Werner and his team are also working on longer-term solutions to the entanglement issue. NOAA recently granted them $226,000 to conduct research on ropeless fishing gear that lobstermen could use off the coast of Maine in place of the traditional vertical lines that cause entanglements. Vikki Spruill, president and CEO of the aquarium, said in the release that she hopes to see the team’s work have a lasting effect on the populations of local marine species. “It’s our mission to find conservation measures that make a difference,” she said.